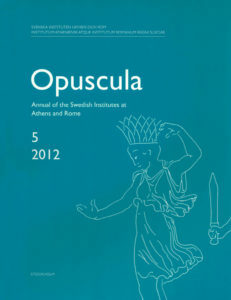 Opuscula 5 (2012) is now available for purchase and free download at Bokorder.se. Also available at Amazon.com, Amazon.de, Bokus.com, and Adlibris.com. The main objective of the excavations of the Late Cypriote city of Hala Sultan Tekke is the investigation and determination of the complete occupational sequence of the pre-12th century levels. The groundpenetrating radar survey (GPR) led to the discovery and excavation of numerous rooms of a large Late Cypriote complex. During the second year of excavations at the site the expedition exposed a third phase of occupation (Stratum 3). A Stratum 2 compound, with extraordinarily wide walls was uncovered in the eastern part of the excavations. Intact vessels include Base-ring I and II, and White Painted VI, and Late Helladic imports. Other wares include: White Painted Pendant/Cross Line Style, Red-on-Black/Red, Bichrome Wheel-made, White Slip I and II, Monochrome, Base-ring I and II, Red Lustrous Wheel-made, White Painted/Plain-White Wheel-made, and White Shaved. Unique discoveries amongst the small finds are a haematite cylinder seal and a stone pendant figurine. The numerous tools related to textile production point to the manufacture of fabric on a larger scale.